Posting your mailaddress on the site <a href="mailto:user[at]provider.com">webmaster</a>. This is not recommended because spambots are designed to follow those URL's. Additionally, this type or URL opens an external mailing program which can be very annoying for your readers. 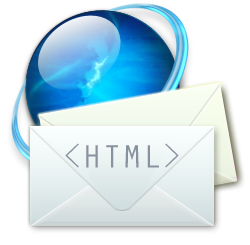 Here is the solution: Create a mailingform using only HTML. Very easy to install / implement on your website. EMAILADDRESS. Change this to the mail address you want the mail to be sent to. RESULTURL. Change this to the URL you want to redirect your users to after they've sent their message. SUBJECT. Change this to the subject of your mail. *NOTE*: The form implemented above will not work, because there is no emailaddress entered. If you want to contact me, use the contact page or post it in the comments. Ok, it's not the best looking mail you probably ever had, but it works and if you have brains you would understand it. Now you can contact your readers and answer them! I'm sorry to inform you that this script doesn't work anymore. The "mailto.exe" from Universal is now not handling any mail traffic. Let's try another solution.